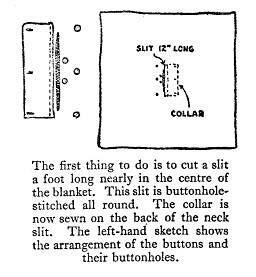 IN this chapter we will grapple with a very simple spare time activity, for a South American poncho is one of the easiest things to make, and at the same time one of the most useful. Some time ago some of you were making the Arab abaiah as a camp-fire garment. Instructions for making it are given in Chapter VII. If you have already made one of these you probably will not need a blanket poncho for the camp fire, but you can make one out of waterproof material to keep you dry in wet weather, and also to use as a ground sheet. 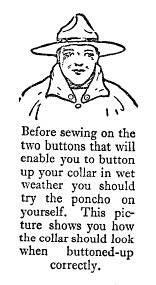 For those chaps who are doing a lot of hiking a poncho made of balloon fabric, or similar material, is a splendid thing to have. You can leave your mackintosh at home, and slip your waterproof poncho on if it comes on to rain; while at night it forms a ground sheet practically big enough for two to sleep on. 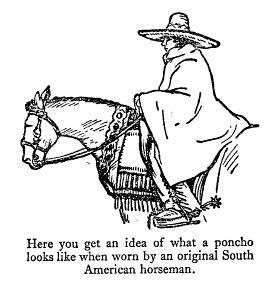 If, however, you have not made an abaiah, the poncho, which is the garment of the South American horsemen, and made by them out of a blan t ke , is well worth consideration, for the blanket requires very little alteration, so that its usefulness for sleeping purposes is not impaired in any way. Blankets nowadays are so cheap that you can get one for less than it costs to buy a dog licence, in fact you can get about two blankets for the price that you pay to keep a dog ; so expense need not prevent you making a blanket poncho. This page was last edited on 20 October 2011, at 16:34.